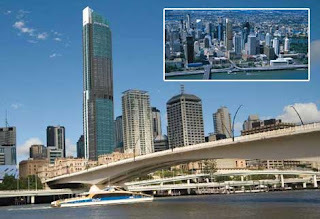 Construction will begin later this year on a 65-storey residential, commercial and hotel high-rise on Elizabeth Street that is set to dominate Brisbane's skyline. The tower will comprise 306 luxury hotel suites, 98 two and three-bedroom apartments and six penthouses. A recreational area will be located on level 30 of the building and feature a luxury day spa, 20m indoor swimming pool, sauna and gym. Metacap director James Chopard said permanent residents would have access to services like gourmet chef-prepared room service, housekeeping, a concierge and valet parking. Designed by architecture firm Cottee Parker, the soaring green skyscraper will dwarf neighbouring buildings and sit across from the car park entrance to the Myer Centre. Colliers International has been appointed as marketing agents for the development and two-bedroom apartments will be priced from $1.3 million. Construction is expected to start at the end of the year and completion is scheduled for 2012.